Team Graham wins the 2018 Braggins Rights! Team Graham complete the Major Comback! In Dramatic Fashion on the final night of action, Team Graham overcame a 2 point deficit behind Team Thompson to win the 2018 Moosehead Men's League! Team Graham, which was also know as "The Geriatric Team" clearly played their guts out and can also attribute their success to having most of their players in action all season. Team Thompson, who won the regular season, finished in 2nd place, 6.5 points behind 1st place. Captain Mike Thompson was so upset, he went straight to the airport to an undisclosed location, where he can regroup and see if he can put a master plan together for 2019. Team Roberts finished in 3rd place with the help of their big gunners Roberts, Hunter and McHugh. Laurie Melanson and Adam Mosher were also pivotal in the weekly net scores as well. Last years champion, Team McCarthy placed in the 4th spot this year. Team Myles grinded their way into 5th place, despite missing Stuart Earle on the final night. Team Buckley was the last team to make the prizes, finishing in 6th place. Team Hubbard had a very hard to watch fall from grace, as they were leading the whole league only 5 weeks ago. It was like a car crash that you just couldn't take your eyes off of, and you knew you should stay far away from the carnage. Team Earle was missing captain Earle and fell apart without any real leadership. Team Cunningham had their captain forget his golf clubs on the final night, and he still managed a 38 with a set of rentals. Team Savoy once again earn the 10th spot, same spot their earned in 2018. Looks like being picked by Captain Savoy is the kiss of death in this league. If you finished in the top 6 teams, pick up your prizes in the Proshop. Bunker Pot went to first name drawn again this year and that was Sid Powell, who hit the green then calmly rolled in a 20 foot putt for $500! Congrats Sid! This year we are starting a new tradition with Westfield, Riverside and Hampton. With all 3 clubs using the same men's night software, we have decided to have a year end Ryder Cup Style event where we take the top 4 Gross and 8 Net averages for the season to represent each club. You must have attended at least 7 weeks out of 13 to be eligible for the Team. The event will take place at Riverside this year and will be on September 29th. Please notify Steve Leblanc if you are not able to play in the event. Huge Thank you to Seamus Cox (Cox Law Office) and Chris Gallant (Royal Lepage Atlantic) for their continued support of the league. Enjoy the rest of your season gentleman! This coming Wednesday will be the final day of the 2018 Moosehead Men's league, and what a year it has been. Not a single rained out day. Consistently over 100 players per week and a what looked like to be a wire to wire win for Team Hubbard has taken a horrific turn for the worst for them. Team Thompson on the final week of the regular season took the lead to finish 1st heading into the playoffs. Team Graham, who were at one point among the worst in the league, now sit 2 points back from first place. With first place on the Final night being worth 45 points, there are 6 teams that can legitimately win the championship. So get your chores down now, do all the sucking up you need to do, start planting the seeds of a horrible cold amongst your co-workers, and make sure you attend the final night. The Prize Presentation will be made at 8:00 pm in the club house, please have all you 9 holes in by then. The Bunker shot wil be at over $500 which we will post the names of gentlemen that will get to attempt to win the pot at the beginning of the day. One final incentive is a new Tri-Club competition that we are starting this year among Riverside/Hampton and Westfield. In what will be a Ryder Cup Style format, we will be taking the top 4 Gross and 8 Net players (Your final yearly average), to be Team Westfield. The date is still TBD, but this should be a fun event. Here are the standings as of today. (Must have played in a minimum 7 weeks to be eligible) Ties will be broken by the player that has paricipated in more weeks. Week 2 Playoffs is a go!! Men's Night is a go for today. But the rain is coming around 6:00 pm. Don't let your team mates down. 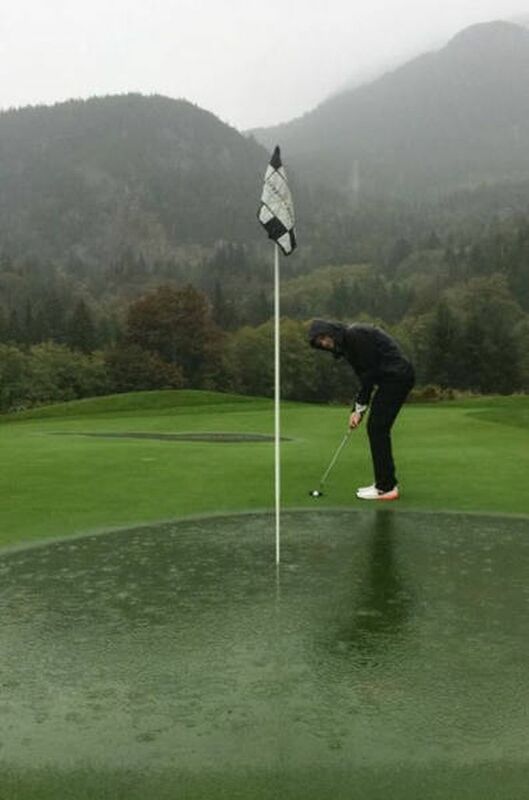 Get out the rain gear and get your 9 holes in! Only 2 weeks of the League left! One week til Playoffs start! 6 Team Horse Race with 2 weeks to go! Team Graham doing the bare minimum..
Week 1 is in the Book! 2018 Moosehead Men's League is underway!